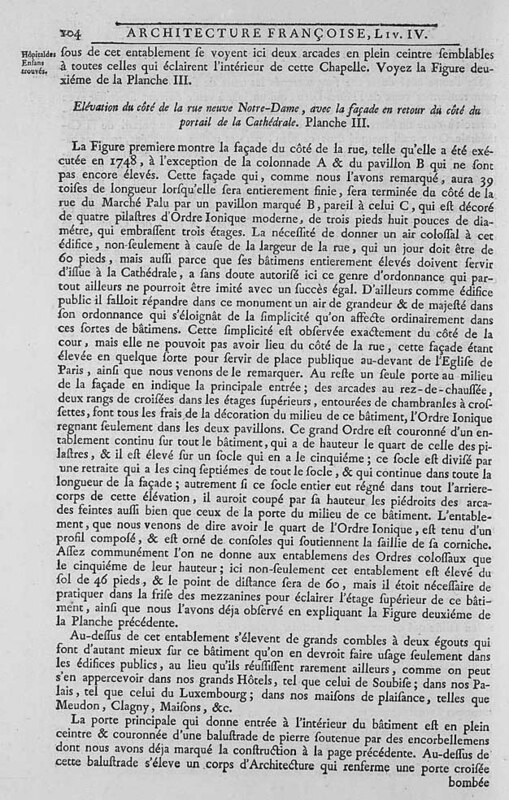 In bygone days in France, desertion of infants was a fact of life. 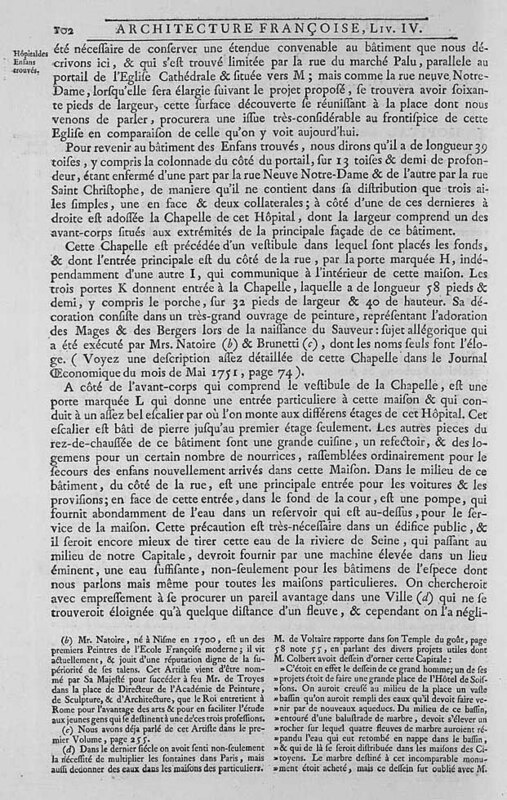 Saint Vincent-de-Paul, assisted by the Daughters of Charity, set out around 1630 to help these unfortunates. Within a few years, he had lain the foundations for institutions for abandoned children. 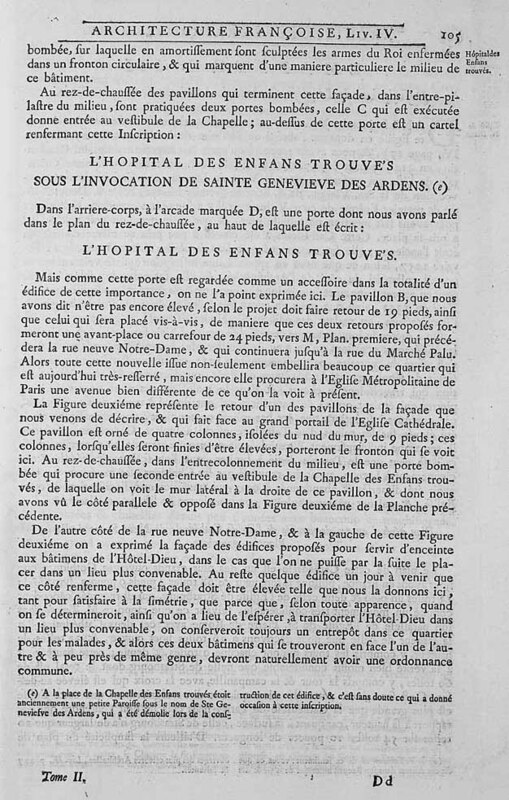 The work of St. Vincent-de-Paul was recognized in 1670 by a royal edict that created l'Hôpital des Enfants-Trouvés (Hospital for Foundling Infants). During the early years, abandoned infants and older children were gathered into several existing houses scattered around the city. 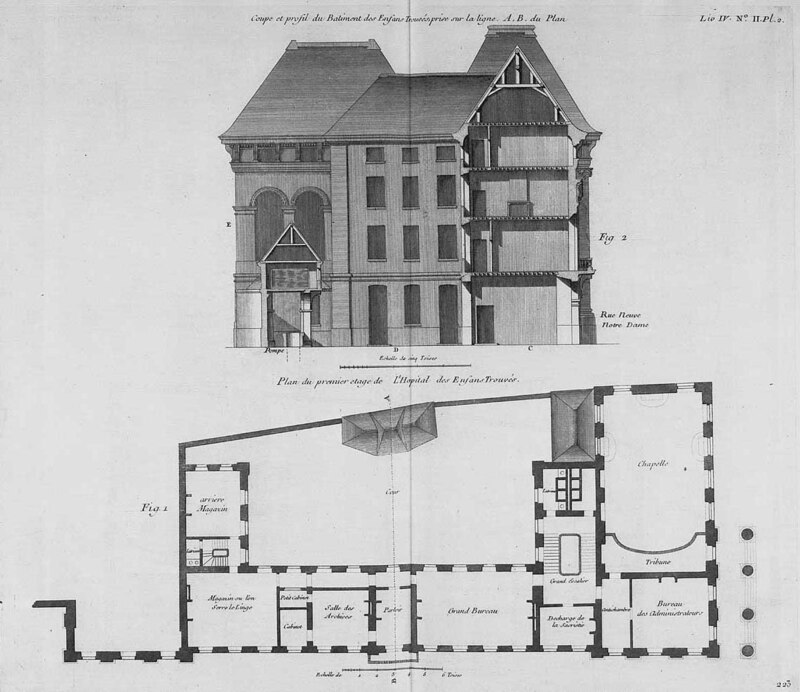 Around 1748, a building was established near the Cathedral of Notre Dame that was dedicated to the care of foundling infants and benefited from regular visits from physicians and surgeons. 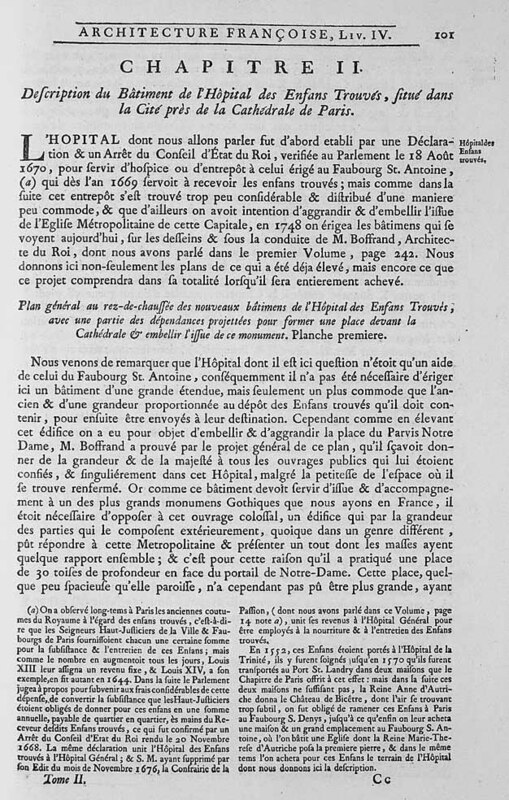 Older children were housed at the institutions of Enfants-Rouges, Enfants-Bleus, and the house of St. Antoine elsewhere in the city. In spite of these efforts, mortality was enormous, and it is estimated that only 10% of the abandoned infants reached the age of 5 years. 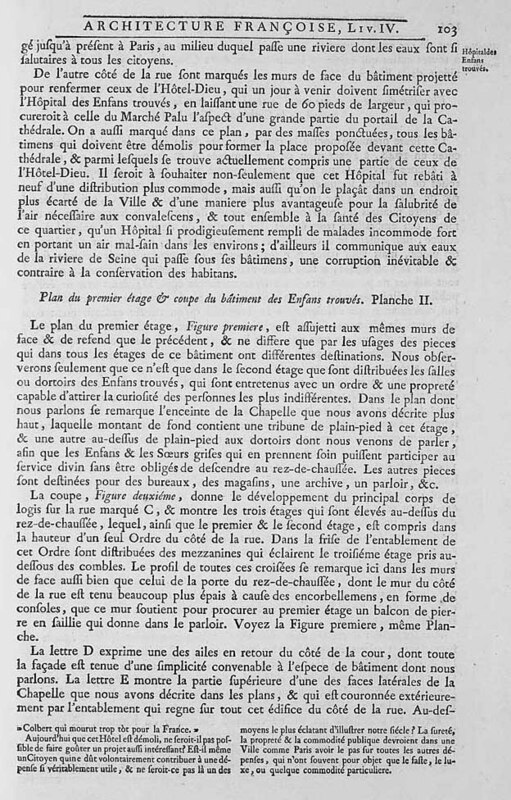 The early history of the hospital, as described by Arrault, its Director, in 1746, is available in French as a PDF file. General plan of the ground floor of l'Hôpital des Enfants-Trouvés and surroundings, including references to the the nearby Cathedral of Paris (Notre Dame), as drawn in 1748 by the architect M. Boffrand. 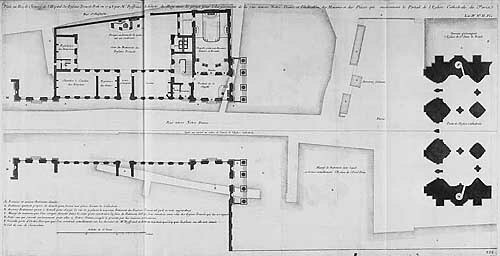 Plan of the 1st floor of l'Hôpital des Enfants-Trouvés (2nd floor for American readers) and profile of the building. Elevation views of l'Hôpital des Enfants-Trouvés. Front of the building as seen from the Rue nueve Notre Dame. 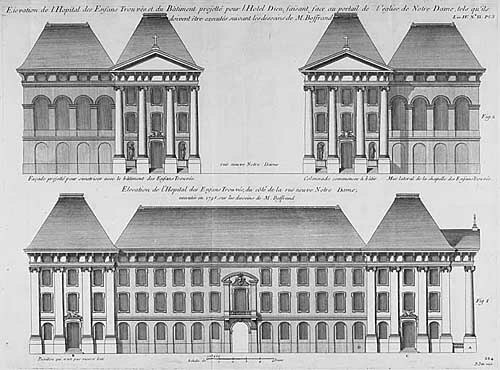 The design of the hospital is described in detail in Architecture Francoise, Volume 2, pages 101 to 105, by Jacques-Francois Balondel, 1752. 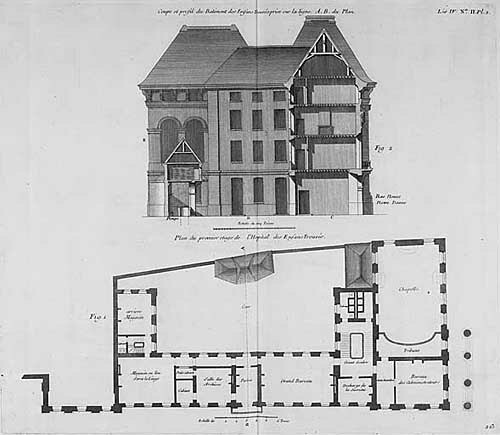 After the Revolution, l'Hôpital des Enfants-Trouvés was replaced by the modern Hotel Dieu. 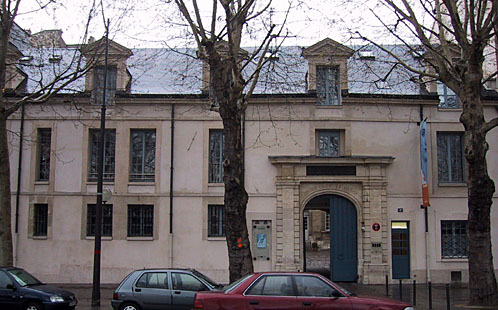 Historical documents and artifacts related to l'Hôpital des Enfants-Trouvés can be found at the Musée de l'Assistance Publique - Hôpitaux de Paris (shown below), at 47, quai de la Tournelle, 75005 Paris, France. 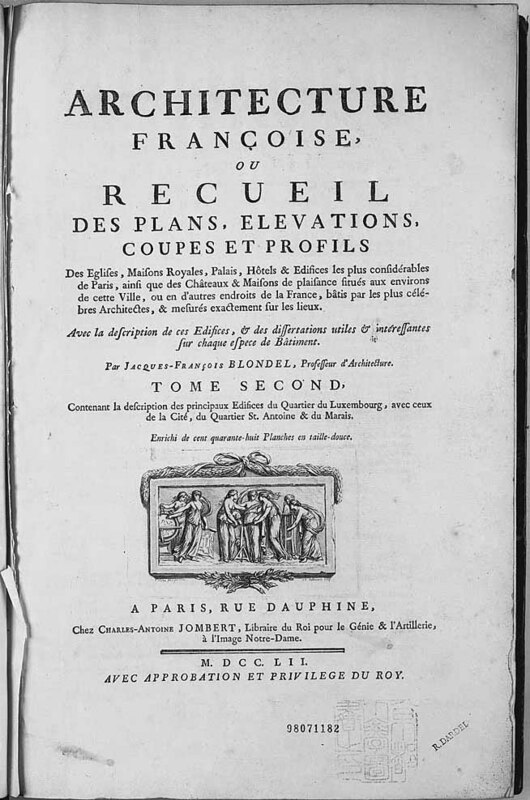 See also Le Tour d'abandon.